We have been in business for over 30 years! Please ask for a list of customer references who will attest to our professionalism, cleanliness, fair pricing, and project satisfaction. Ultimate Woodworks, Inc. installs all types of cabinetry projects inlcuding Armstrong®, Wilson Art®, Gilbralter®, and Hanex®. We also specialize in working with retirement homes, assisted living facilities, healthcare centers, and offices. We custom build nursing stations, reception desks, podiums, conference tables, counters, wet bars, and all other types of cabinetry. For over 30 years we have served customers in Florida. No job is too small or large. Our crews take great pride in professionalism, cleanliness of the job site, and most importantly the quality of our craftsmanship. 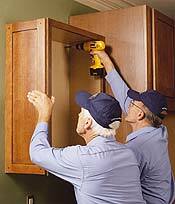 Licensed and insured, we are Florida's best cabinet installers for your next project! Click the photos below to view some of our recent projects! Copyright © 2008- 2010Ultimate Woodworks, Inc. All rights Reserved. Design & Hosting by CompBiz, Inc.